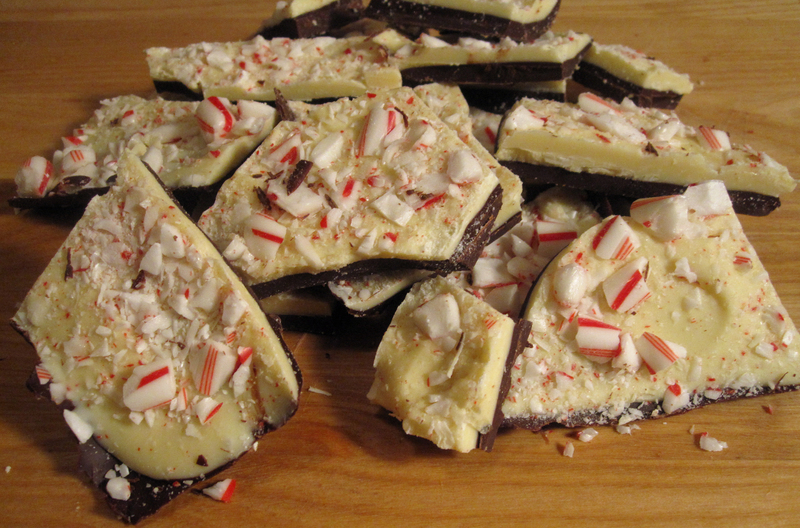 One of my favorites things is peppermint bark from William Sonoma. A couple years ago, Chrissy got me some for my birthday. Last year, Charlotte awesomely made me some. This year, I wanted to try to make it myself and give it to a someone (who should receive it via fedex tomorrow). Terry sent me this recipe- from a Philly paper. Would be great for holiday parties/office gifts. It is so good- and is very easy- you are just basically melting chocolate. Make sure you use good chocolate- I always go Ghiradelli. I used about a 9×13 inch jellyroll pan. You’d think- the thicker the better- but this was actually perfect thickness/proportions—too thick and it separates and is hard to eat. Line a jelly roll/baking sheet w. edges with parchment paper. Put candy canes in a zip lock bag. Bang with a frying pan to break up. Melt dark chocolate in a heatproof bowl (pyrex bowls work great) over simmering water (just a couple inches of water- it shouldn’t touch bottom of bowl) in a small saucepan . Pour and spread melted chocolate on prepared sheet. Refrigerate until firm (only takes like 10/15 minutes). Melt white chocolate. Pour and spread on dark chocolate. Sprinkle on candy cane pieces and dust. Refrigerate again until firm. Break/chop up as you wish. Anonymous can attest that these are delicious!! !